Maybe you guys can help me with this question. Is Robin Hood Kevin Costner, Russell Crowe, or a cartoon fox? Personally, I’m pulling for Sean Connery or Errol Flynn, but either way, I’m pleased that Bowmaster is tapping into my childhood fantasies of being a crazy archery master. And I don’t even have to shoot any poor bunnies! 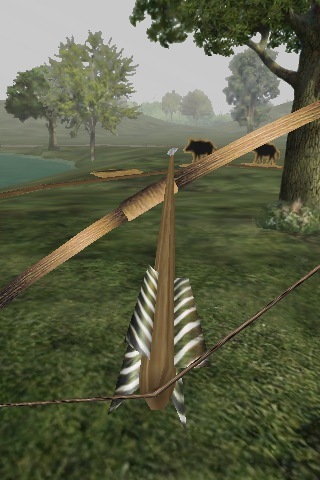 A fully 3-D archery sim, Bowmaster has you testing your shooting skills against the Merry Five. This means five difficulty levels of zinging action as you notch, draw, and loose your arrows at dozens of moving targets. Instead of an outright hunting massacre, Bowmaster cuts out the blood and gore by giving you a shooting gallery experience, with cardboard animals on tracks instead. It may sound unrealistic, but I can guarantee that if you were shooting that many arrows at real animals, all the wildlife would clear out really quickly, leaving you with nothing to aim at. Cardboard animals may seem odd, but they give you a much more dynamic experience than shooting at hay bales, and you get a satisfying thunk when one falls over. You’ll shoot dozens of arrows in a single match, so getting the mechanics down is essential, but, thankfully, the shooting mechanism is remarkably smooth. You use one thumb to aim the bow and the other to draw back the arrow. Pick up your thumb to release the arrow, and then watch the arrow fly. Tilting your phone to the right or the left changes the view so you can find more targets. Your opponent is also shooting at the same targets, so you have to be quick lest he steals all of your kills. Although you always have a computer opponent, the game is entirely single player, which is a little unfortunate. There are online leaderboards, but I could easily see people having a blast competing with their friends too. The game is also sorely in need of a practice mode or free shoot mode, but the developers report that they are planning on adding that in a future update. I would also love to see more levels in the future, but I’ll admit that the five they have are definitely a healthy challenge. If you’re looking for a story-driven Robin Hood game, you won’t find it here, but this is still a seriously fun and addictive little app. The graphics are really quite lush and lovely, and I was really pleased with the overall game controls. There’s not a lot to do, but what there is to do works flawlessly. Wrap it all up with the affordable price tag of $0.99, and you have yourself a very nice archery sim. If you’ve ever dreamed about being Robin Hood, then Bowmaster is definitely worth a look. AppSafari review of Bowmaster was written by Tracy Yonemoto on May 26th, 2010 and categorized under Action, App Store, First Person Shooter, Games. Page viewed 4605 times, 2 so far today. Need help on using these apps? Please read the Help Page.